To some, a “challenging” book means one in which the writing is convoluted and “un-fun to read” and, possibly, isn’t worth the effort. 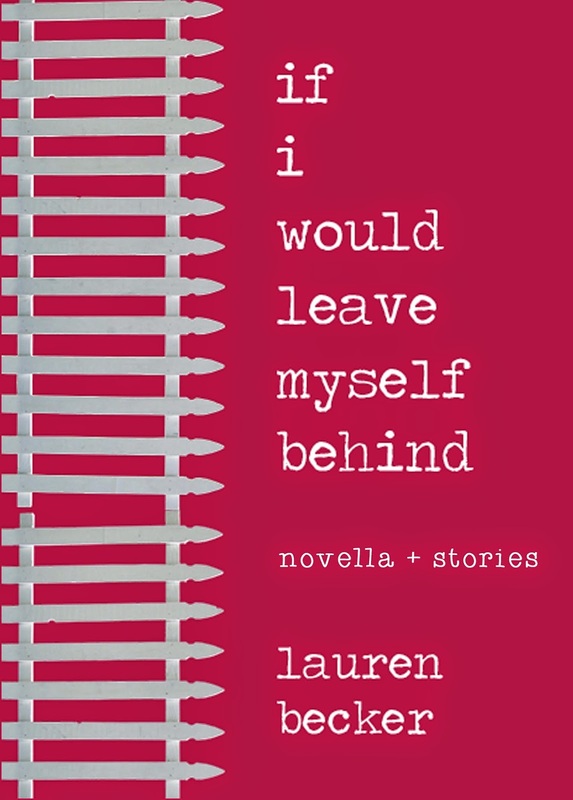 Happily, if I would leave myself behind, a collection comprised of a novella and short stories by Lauren Becker, the effort demanded from readers is more than worth it. Becker’s stories challenge us in a couple ways to reveal the tragic aura of contemporary romantic relationships. While “challenging” might suggest literary mega-fauna like Infinite Jest, Becker’s extreme concision is one demanding aspect of her stories. Other than the novella, the stories are flash-fiction length, and what’s included in these brief portrayals prompts readers to extrapolate what’s been left out and why. Becker withholds much, pushing readers into the mindset of her characters who are forced to make judgments about others on limited information. In Object Lessons: The Paris Review Presents the Art of the Short Story, Jeffrey Eugenides introduces Denis Johnson’s masterpiece “Car Crash While Hitchhiking” by saying that Johnson finds “a way to leave out the maximum in terms of plot, setting, characterization, and authorial explanation while finding a voice that suggest[s] all these things, a voice whose brokenness is the reason behind the narrative deprivation, and therefore a kind of explanation itself.” Becker also leaves out “the maximum” to plunge readers into the minds of the desperately lonely. Similar to Johnson’s characters, Becker’s have a “brokenness,” though hers read more as “incompleteness,” which drives them to seek out unsuitable romantic partners. The protagonists know they’re unsuitable, too. For instance, the narrator of “boilerplate” sleeps with a man she doesn’t much like and actively keeps him at a distance. She wants only to remember “his common name,” which she “only borrowed for as long as it took to add to the list that I told myself again should end with the next.” He’s not a good match, and readers can see that she’s already imagining him as part of a prologue to her final relationship. Yet, she’s felt this way before and has thought each terrible choice would be the last, but they weren’t. Purchase if i would leave myself behind HERE.